Most of the oil rig job descriptions below pertain to a typical semi-submersible offshore drilling rigs crew members. However, most disciplines are also found on jack-up drilling rigs, drillships and production platforms also.....a rough guide to the salary is indicated in brackets, some are accurate, some are guesses on my part. Offshore oil rig jobs or drilling rigs. Offshore oil rig jobs or drilling rigs. Offshore Installation Manager (OIM) (£70,000); has often worked his way up through the drill crew ranks. He is in overall charge of the oil rig platform. Hence sometimes called "Person In Charge" (PIC). Toolpusher (£60,000); works in the rig offices and the rig floor. He also has responsibilities on the main deck. He is usually an experienced driller. Company Man (£90,000); is the oil company's on board representative. He is not employed by the drilling company operating the rig. On a drilling rig an oil company employee works with the drilling company to supervise its interests, helping the strategy for drilling the well. Offshore oil rig jobs or drilling rigs. Driller (£50,000); has a high level of responsibility, and is in charge of everything happening on and above the rig floor. He is the man that actually operates the drilling equipment, making the hole in the sea bed. Which is the reason the rig is there in the first place. Offshore oil rig jobs. Assistant Driller (£42,000); has many tasks to perform most vary depending on particular drilling operation being carried out at the time. He is direct supervisor for the Derrickman and Roughnecks. process room at all times. Derrickman (£38,000); is responsible for the maintenance and smooth operation of the mud pumps and mud holding pits among other machines in the mud pump room. Also assists the Roughnecks when very busy on drill floor and not required in the pump room. This is the man who will climb the derrick, the tall drilling tower, to assist racking drill pipe when it is being pulled out of the hole. Roughneck (£28,000); works on the rig floor in a team of three and is responsible for the operation of equipment and machines as required by the particular operation being carried out at that time by the driller. While drilling, one Roughneck is always present in the mud room. Offshore oil rig jobs or drilling rigs. Subsea Engineer (£50,000); is responsible for the Blow Out Preventer (BOP) unit and the motion compensation system of the rig among other duties. Assistant Subsea Engineer (£40,000); can sometimes be promoted from Roughnecks. More usually from a mechanical background. Oil rig jobs or drilling rigs. Crane Operator (£35,000); is responsible for all crane operations on the rig and to/from the supply boats. He is supervisor to his assistant and the Roustabout crew. Assistant Crane Operator (£28,000); is an experienced Roustabout who is also qualified to operate the cranes and will often be next in line for promotion to Crane Operator when a position arises. Roustabout (£25,000); main duties include guiding the crane as loads are moved about the deck, supplying equipment to the rig floor as requested and keeping pipe deck and main deck areas clean and tidy. Will also assist Roughnecks on the drill floor when required. This usually only happens when the Roughnecks are too busy to get a meal break. The Roustabout will get his meal, then go to the drill floor allowing one Roughneck to get his break. Then each Roughneck swaps out until everyone has eaten. Radio Operator (£30,000); Modern radio systems dictate the need for a GMDSS Radio Operator's Licence. Responsible for onboard communications systems, helicopter logistics, preparation of Personnel On Board lists, lifeboat and emergency muster lists, T-Cards etc. Since the advent of modern radio the radio operator's job has changed tremendously. A good modern Radio Operator will have excellent PC skills, good admin skills and must be able to get along with people as the radio room will be the focal point for most peoples communications in and out of the rig. They also get landed with other administrative jobs that no-one else seems to have the time for. He might also be find himself labelled as the resident I.T. tutor / network administrator. Medic (£40,000); They are rarely doctors but have a high level of medical training. Some are former nurses. On some smaller rigs they double up as a Rig Safety & Training Co-ordinator (RSTC). They are responsible for the upkeep of the Sick Bay and the medical stocks, issuing medicines like a pharmacist. Most rigs now carry out medical checks on all employees every six months or so. Keeping of rig medical records. The rig also has designated first aiders in every crew. Offshore oil rig jobs or drilling rigs. Maintenance Supervisor (£50,000); either has an electrical or mechanical background and oversees the whole maintenance crews work. Offshore oil rig jobs or drilling rigs. Electrician (£40,000); responsible for all electrical equipment onboard the rig right down to the changing of light bulbs within the accommodation. Mechanic (£40,000); responsible for all mechanical equipment onboard, including the drilling package. Motorman (£32,000); general engine room duties ensuring smooth running of rig power. Oil rig jobs or drilling rigs. Instrument Technician (£38,000); responsible for calibration of measurement equipment, gauges, alarm panels etc. Offshore oil rig jobs or drilling rigs. Barge Engineer (£40,000); is in charge of control room operations. He will often be a time served Master Mariner from the Merchant Navy who has crossed over into the oil industry. Responsible for stability of the rig, anchor handling operations during a rig move, supply vessel operations and the like. Control Room Operator (CRO) (£35,000); Barge Engineer's assistant and responsible on a daily basis for keeping the rig afloat. He will also be involved with anchor running and retrieving operations during rig move plus a whole load of paperwork besides, work permits etc. Painter (£25,000); Given his work by the Barge Engineer, the Painter is responsible for the rig painting program. Like the Forth Road Bridge it is a never ending job. Often working at heights with scaffolding safety harness and or work basket hoisted by the crane. Usually builds his own scaffolding. May have an assistant, especially if the rig does not have a Maintenance Roustabout squad. Offshore oil rig jobs or drilling rigs. Maintenance Roustabout (£25,000); main duties include general upkeep and cleaning of deck area of rig. Also painting. Offshore oil rig jobs or drilling rigs. Maintenance Foreman (£28,000); responsible for overseeing a Maintenance Roustabout Crew’s work. Welder (£35,000); They are permanently on one rig and carry out all day to day repairs and building of new metalwork. They are always busy. When there is a big project often a squad of welders are hired to finish the job quickly. These guys move from rig to rig wherever their company has a contract. It’s fair to say that Welders are responsible for the majority of fires onboard drilling rigs. Oil rig jobs or drilling rigs. Rig Safety & Training Co-ordinator (RSTC) (£40,000); There is a lot of responsibility. A job for someone who is a good communicator and has good organisational and computer skills. 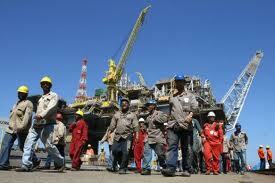 You will also require a lot of knowledge of the offshore safety laws and company policies. Materialsman/Storeman (£30,000); Responsible for the maintenance of the stores and stock ordering and receiving. Must be computer literate. One drawback of this job is that on smaller rigs with only one stores person they sometimes have to get up at all hours to check the cargo coming off the boat. Camp Boss (£30,000); in overall charge of the catering department. Oversees the chefs, stewards, stewardesses etc. Chef (£27,000); day to day cooking duties, reports to the Camp Boss. Oil rig jobs or drilling rigs. Night Cook / Baker (£25,000); very important position on the rig. All bread onboard is baked by the night cook/baker. Offshore oil rig jobs or drilling rigs. Scaffolders (£30,000); are not usually tied to any one rig. They go to different installations depending on where their company has work. Mud Engineer (£50,000); is in charge of the drilling fluids being used. S/he will likely have a degree in chemistry and will have a good knowledge of drilling procedures. Offshore oil rig jobs or drilling rigs.